A Tree So Red It Had to be Trademarked! 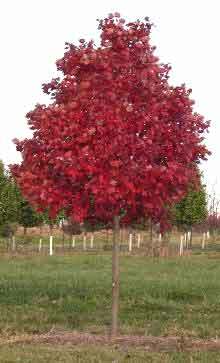 The October Red Maple is an improved cultivar over all other Red Maple Trees... its superior red color is shades brighter than other trees' foliage. Commonly used to line drives or boulevards, which leads to an unbelievable display of color in the fall. An ideal landscaping tree... a fast growing tree that requires minimal attention! All you have to do is plant your tree and enjoy the show! 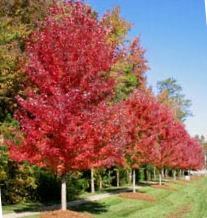 October Glory Maple Trees quickly mature into a pleasing oval shape, reaching up to 40 feet. Your October Glory tree will be attracting attention throughout the fall with its intense fall foliage. 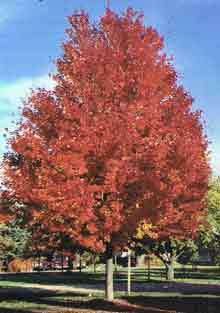 Not only will it give you a brilliant red show in the fall, but its incredible color is very reliable. October Glory Maples will even grow in warmer climates not suited for trees that specialize in fall color. Other trees could give you a dull fall color, but these will still provide you with an incredible fall red color. Its leaves fall later in the autumn season than other trees, meaning you have more time to enjoy the bright red color! Enjoy your October Glory's proud display of red foliage while other trees have no leaves left! 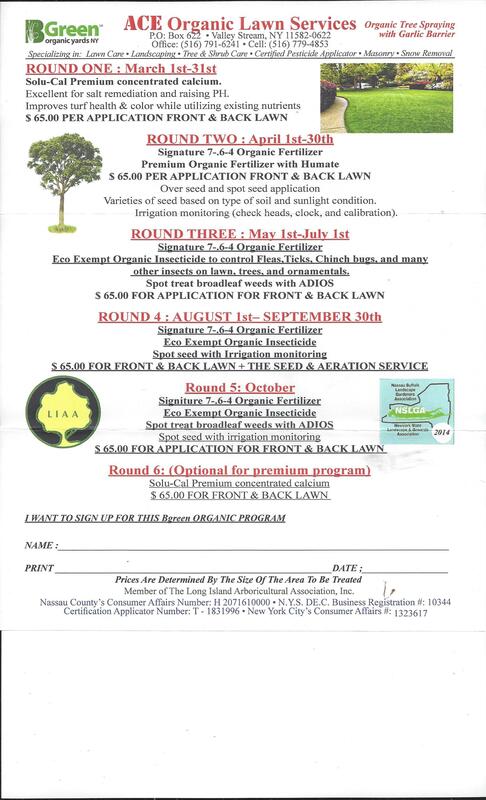 One of the most popular new tree introductions in history�and named �Urban Tree of the Year!" Brilliant Fall color with minimal mess! Its seedless flowers don't produce seedlings! 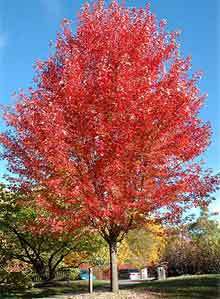 The Autumn Blaze Maple is a hybrid of two famous trees, the red and silver maples, and it soon surpassed them in looks and popularity. It captured the two trees' superior characteristics, such as brilliant red color, dense branching, and rapid growth rate. A very easy tree to grow and transplant into your yard. Adapts to a wide range of soils and climates. Enjoy Bright Red Color for Months... Not Weeks! Imagine having the only tree in the neighborhood that displays a spectacular show of red foliage in the middle of summer! Proudly display your shimmering Summers Red Maple in a sea of boring green. 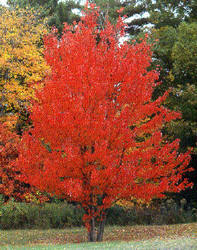 Your Summers Red Maple is a new cultivar that was bred to display its red foliage from early spring to late fall. You'll enjoy its bright red color for as long as 5 months out of the year! This vigorous tree was also developed to be fast growing and easy to grow. 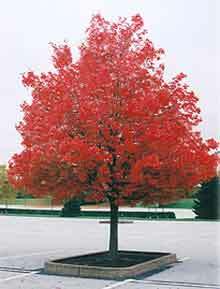 This attention-grabbing tree will quickly become the highlight of your property with its vibrant red color. The tree's personality will accent your lawn perfectly. Your Red Maples will display bright red flowers before its leaves appear, signaling that spring is on its way. Then they turn deeper shades of scarlet in the fall. Its many branches reach out to give you a nice spread, creating a dense shade that can cool your home during the hot summer months. These trees grow fast for maple trees, approximately 2 to 3 feet a year. 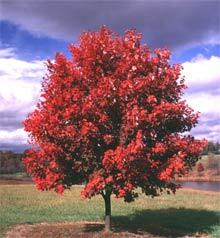 An extremely adaptable tree, the Red Maple can grow in a variety of soil conditions and climates. We send trees with strong, advanced root systems that mature quickly.